Here are blog posts featuring specific storytime themes. For more storytime themes, visit our Storytime Resources. Today I’ve got another fabulous guest post to share! I saw Maggie’s pictures on Instagram and was hooked. 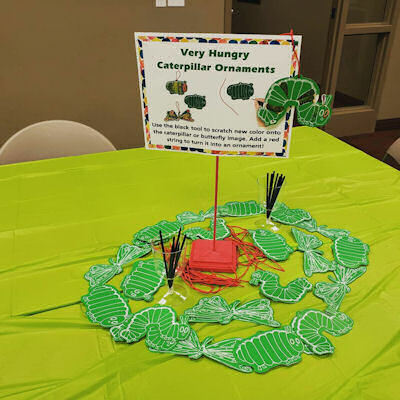 Check out the The Very Hungry Caterpillar 50th Anniversary Celebration event she put on! Maggie Salisbury has worked as a Children’s Librarian at the Floyd County Public Library in Prestonsburg, Kentucky for the past four years. You can follow her blog, The Podunk Librarian, at her website, Pinterest, and on Instagram. 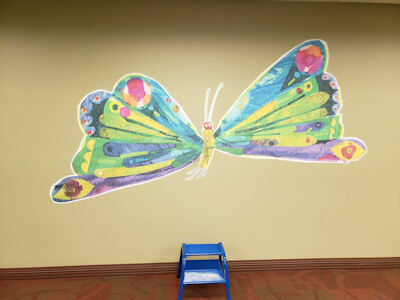 2019 marks the 50th anniversary of Eric Carle’s The Very Hungry Caterpillar. 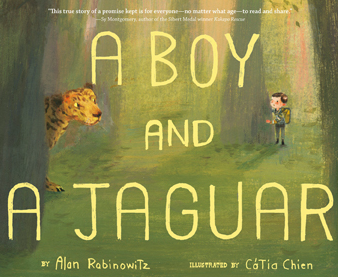 When a classic book reaches a milestone, it’s always cause for celebration at the library! Not only is it a fun and easy draw for patrons, but we’re reiterating that books are important; they have value, they’ve been around a long time and they’re not going anywhere. The event was planned with the target age group of the book in mind. In an effort to present different activities that were both fun and educational while still celebrating The Very Hungry Caterpillar, we had six different activity stations. Station 1. 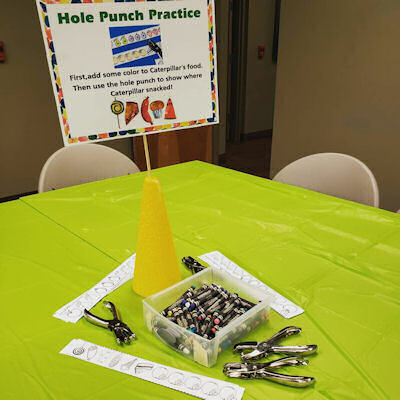 Hole Punch Practice: Here, children could practice fine motor skills while recreating illustrations from the book. This free printable at Books and Giggles allowed the kids to first color the fruit eaten by the hungry caterpillar, then punch holes in them, Eric Carle-style. Station 2. 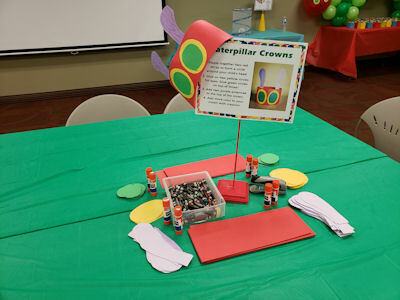 Caterpillar Crowns: this idea came from Libraryland (there’s a template there too!). Kids could be creative and festive putting together these fun hats. 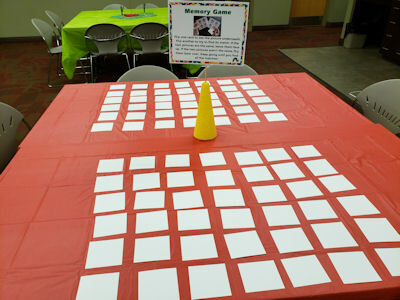 Station 3: Memory Game: this free printable from Playdough to Plato used familiar images from the story. Besides being fun, memory games are great for improving concentration, training visual memory, and increasing attention to detail. It’s also fun as a group activity! Station 4: Ornaments: Another fun craft, and something that the older siblings in attendance got excited about as well. These magic scratch art ornaments were purchased from Oriental Trading, which always has a great selection of Eric Carle crafts and decorations. Station 5: Butterfly Viewing Station: About three weeks before the event, we ordered an Eric Carle Butterfly Kit from Insect Lore. 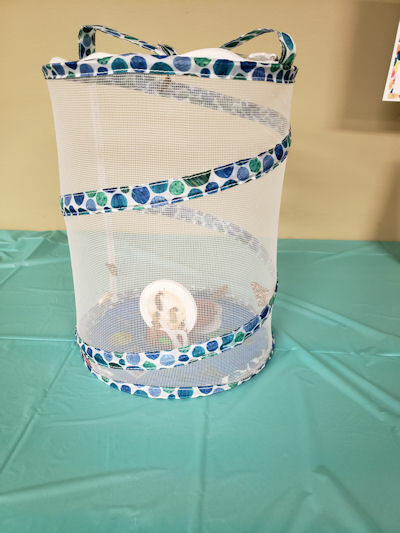 The cup of caterpillars were observed and discussed in Story Times leading up to the event, and children that visited the library could see the caterpillars as they grew, made cocoons, and finally became butterflies, just in time for our big event. More information about butterfly life cycles was also on display at this station. 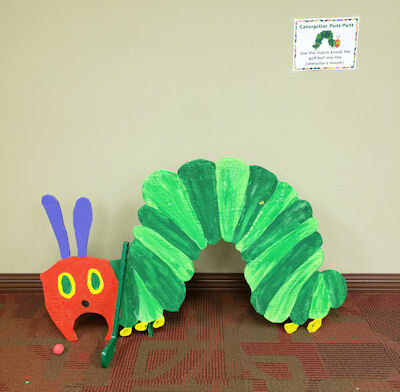 Station 6: Caterpillar Putt-Putt: Feed the hungry caterpillar! We made this game ourselves and plan to reuse it for our Library Mini Golf. Kids usually went for this first station first! Because events of this nature are usually heavily attended, these stations were set up as self-initiated and patrons were free to move to stations as they pleased. To include the actual reading of the story in this format, we utilized our projector. There we played a loop of The Very Hungry Caterpillar animated story and a video of Eric Carle reading the book that continued throughout the duration of the program. 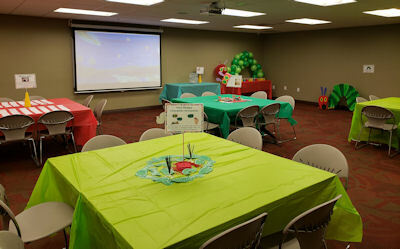 To truly make the event feel like a birthday party for The Very Hungry Caterpillar, we included party favors and cake. We purchased The Very Hungry Caterpillar treat boxes filled with a bouncy ball, sticker, tattoo, and bubbles from Oriental Trading. We also included some coloring pages we printed ourselves. Whenever possible, I try to encourage photo opportunities and present “Instagrammable” aspects to programs. It’s an easy way to get patrons to tell friends about programs and indirectly advertise the library on social media. We used our poster printer to print the final image of the story, a beautiful butterfly. This doubled as a decoration and a photo op—we put out a step stool so kids could give themselves wings for a fun picture. 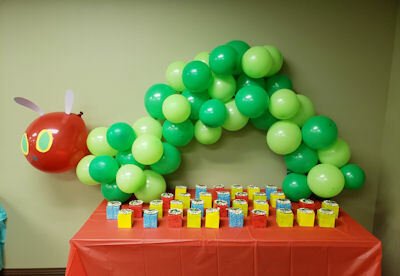 Our other decoration was a balloon caterpillar put together with a low temp hot glue gun. The event was well attended, and because of the timelessness of this book, the activities could easily be reused for future programs. Some could even be adapted for Story Times or school visits. 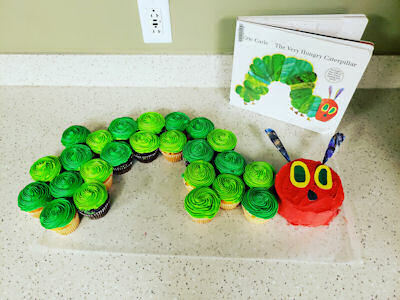 Long live The Very Hungry Caterpillar! Well hello there! Long time, no blog. It’s been a busy fall for us here at Jbrary. Can anyone relate? One of the things that’s been keeping us busy is doing outreach to our local daycares and preschools. One of the most requested themes for this time of year is Halloween. That, coupled with the fact that I just learned a new Halloween song, is the inspiration for this blog post. Without further ado, here are my favourite Halloween songs and rhymes I’m sharing when I do outreach this month. And check out our Halloween Pinterest board for book, craft, and flannel story ideas! 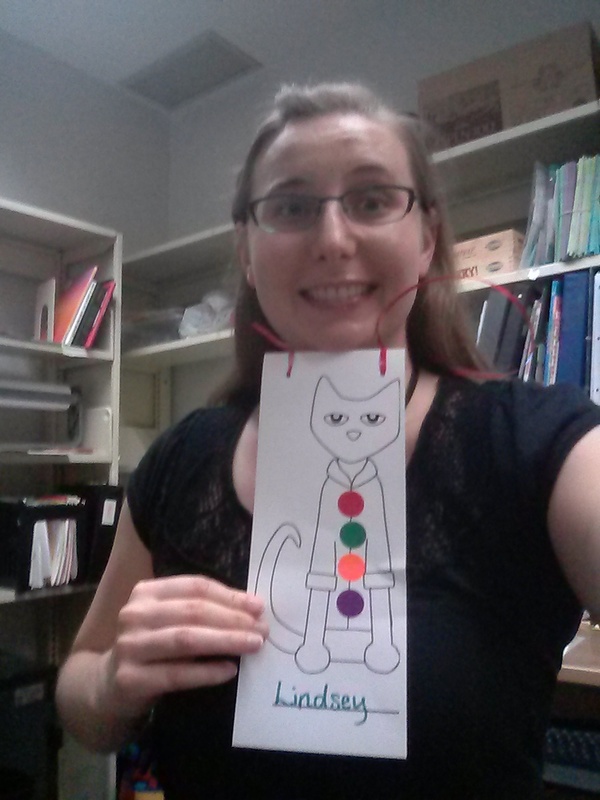 A huge shout out to Melissa McVay, a preschool teacher at Discovery Clubhouse in Cedar City, Utah! She shared this version with us and we hope to film a video of it soon. You can never have too many versions of Zoom, Zoom, Zoom, amirite? This one works well for an autumn theme as well. I use it at the end of storytime as a calming, settling song. We include the sign for pumpkin in the video. There are multiple book versions of this song. In storytime, we do it three times – once at the beginning, once in the middle, and once at the end. Repeating the rhyme three times helps the little ones learn it better. Apparently I like to sing about pumpkins. This is a fun chant we learned from the lovely Rebecca. A monster themed version of Head and Shoulders, Knees, and Toes. A super fun action song and you get to pretend you’re monsters. This is a fun prop song. 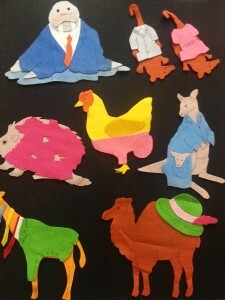 If I’m visiting a small group I’ll bring a bunch of random felt pieces and hand them out. Then kids take turns putting the items into the pot and we talk about what we’re brewing. It can get real silly real fast. 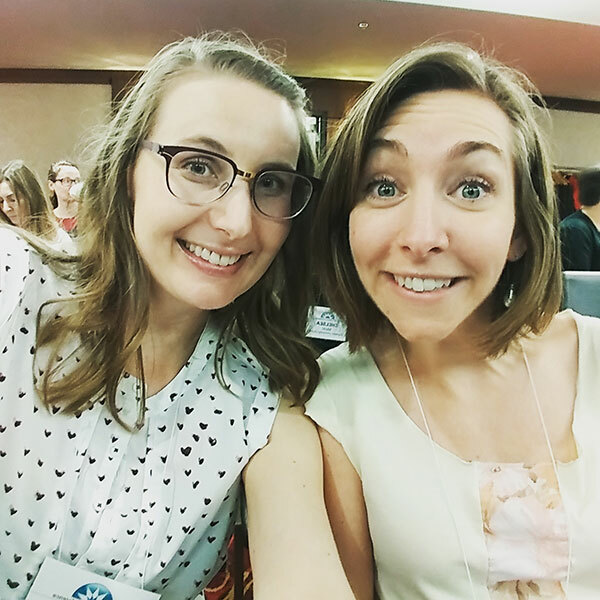 Lastly, if you play the ukelele, definitely check out my friend April’s blog where she shares the chords to tons of storytime songs. She has a massive Halloween round-up right now. What Halloween songs and rhymes have you been singing? Let me know in the comments! We’re all about honouring the season AND our community here at Jbrary and so this week we bring you a wonderfully winter storytime! For the full run down of all of our winter songs and rhymes be sure to check out our Winter Storytime playlist and our Winter Storytime board on Pinterest for books, felts and craft ideas. Now, let’s get started before your hot chocolate cools! This is a perfect storytime song because it work beautifully for babies (have parents bounce them gently on their knees) or big kids (tell them to put their legs out in front of them and hang on) or both! To extend the song ask for ideas of what else could happen on their little blue sled. Often underrated, the Calm Down song is a crucial tool in your storytime toolkit and why not have one that fits your theme? This version of Twinkle, Twinkle could be done with scarves or just voices but is guaranteed to tame the wildest crew. We love this version of We Wish You a Merry Christmas because it allows you to ask your storytimers what they are celebrating and sing about just that. Feel free to spread winter, presents and rainbow kitten cheer! I may have shared this in every post since we recorded it but I simply cannot get enough of this song. Use scarves or just your hands as the sun, rain, leaves and *fingers crossed* snow! 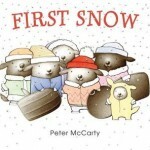 A couple new books which came out in 2015 and would be perfect in a storytime at this time of year are First Snow by Peter McCarty which is about cousin Pedro visiting and experiencing snow for the first time and Supertruck by Stephen Savage which is one part super hero book one part truck book resulting in one great wintery rescue! 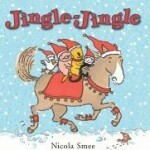 And then I have my old favourites including Jingle Jingle by Nicola Smee, A Hat for Minerva Louise by Janet Morgan Stoeke, Waiting for Winter by Sebastian Meschenmoser and Ten on the Sled by Kim Norman. For more Winter Storytime ideas check out Erin’s brrrrilliant Polar Animals Storytime, Animals in Winter and Winter Toddler Time posts. At Reading with Red Brooke’s got a fantastic Make a Snowman play and learn centre to check out. For more book ideas Katie Fitzgerald at Story Time Secrets collected 10 Picture Books About Winter Clothing plus some awesome activities linked at the bottom. And because she’s the bestest Rebecca at Sturdy for Common Things has put together another definitive seasonal booklist Favourite Children’s Books About Winter! So there you have it folks, lots of great wintery storytime ideas and of course please share your favourites down below. We can hardly believe it’s here already, but with leaves which look as if they’ve been set on fire and cool, crisp mornings Fall has most decidedly arrived. We’ve had a couple folks on Twitter ask for some new ideas for fall themed storytimes and we are more than happy to oblige! Here is a collection of our favourite songs and rhymes, books and more. Let’s start with songs and rhymes. While you can check our our Fall or Autumn Playlist any old time, we wanted to take this opportunity to show off our new favourites! This is a classic counting rhyme which can be done using the book, flannel board or even five little finger pumpkins! This was first brought to our attention by the incredible Rebecca in her post about Pumpkins and Compost. Then imagine our delight when retired Children’s Librarian Jane Willis Johnston who wrote it gave us permission to record. 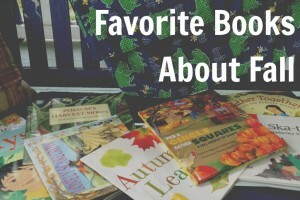 And with that, we happily share what should be the pumpkin pie of your storytime! Please allow us to step away from pumpkins for one quick minute. We learned this one from Anne at So Tomorrow and think it’s the perfect way to sing about rain, sun, leaves and snow or whatever the fall is throwing at you. While not new, Lindsey and I were reminded of this little gem because of how often we get asked for songs and rhymes with sign language. Use the sign language or encourage the children to use their whole bodies with this action rhyme. 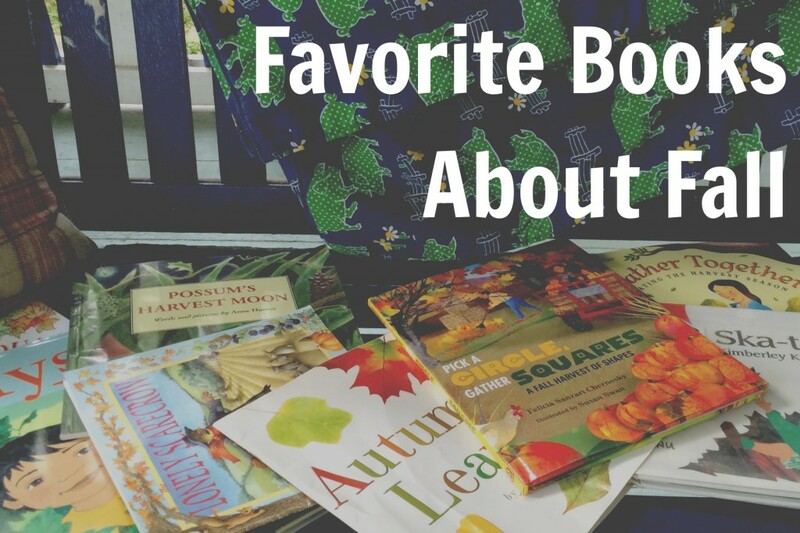 Finally, if you’re looking for craft or extension activities check out our Fall Storytime Pinterest board for these plus lots of books, songs and rhymes. Now it’s your turn: what are your favourite songs, rhymes and stories to share in the Fall? Leave us a note down below! Ever since we learned the song This is Big, Big, Big from Mel I have been on an opposites kick. Factor in the hungry bunch of toddlers I program for on a weekly basis and let’s just say I’ve developed quite a list. Side note: those toddlers can turn on a dime if they don’t get their fill of the opposites. If you know of what I speak read on, in, down and up! To get us started I’ve chosen two Hello and Goodbye song combos which feature our friends The Opposites. In my current position I work mainly with school-age kids, so when I get to do anything related to the 0-5 age range I get SO EXCITED. Last week we had a preschool class come in for a tour and storytime focusing on how to use the library. I had a really short time frame to plan this program, so the first thing I did was look through Dana’s library tours post to collect ideas. From there, I found Bryce Don’t Play’s Pete The Cat and His Groovy Field Trip Adventure! I was completely sold. A huge shout out to Bryce for thinking up this amazing idea and sharing it with us all! Here’s how I took that idea and adapted it for my group. 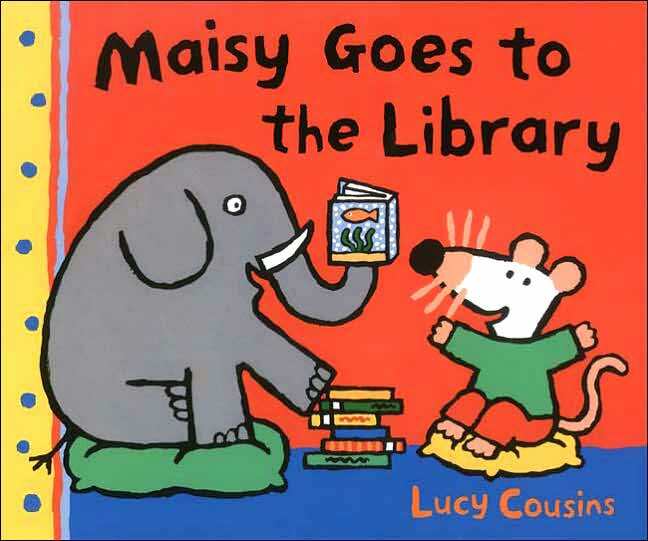 The first half of the program is a modified storytime with a focus on how to use the library. In the second half, we toured the library using Pete the Cat as our guide. The total program was 1 hour. 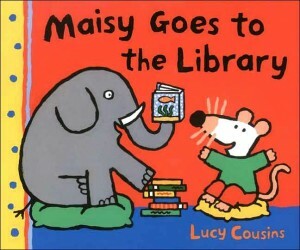 I tried to integrate my discussion of the library into the storytime itself. With new groups I always choose a song they will be familiar with to open the storytime. We did clap your hands, stomp your feet, jump up high, shout hooray, and sit back down. I introduced this puppet as the library bunny. When he popped out of the hat he was holding a piece of paper (which they all thought was a book!). We opened the piece of paper and it had the letter “L” on it. We brainstormed different words that start with the letter “L,” ending with library. Then I explained how we would be learning all about the library today. 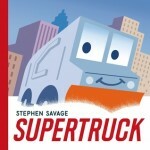 After we read this book, we talked about the different things you can do at the library. I held up things like DVDs, audiobooks, music CDs, magazines, plus some of our puzzles and puppets from the children’s area. I stressed that the library is a place to read and have fun. Having concrete materials to show the kids is really important for this age group, especially if they have never visited before. 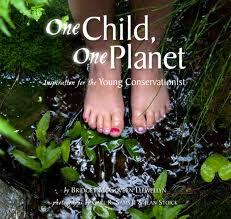 So after putting the call out to our fabulous Tweeps, I got lots of lovely ideas and wanted to throw them all together to create a list of literacy resources for Young Conservationists! Because there is a range in age I’ll break them down as such, though some are great right across the board. 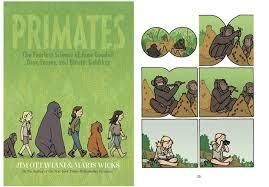 First off a couple of my favourite read-aloudable (shhh!) 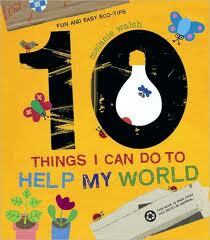 environmental books include 10 Things I Can Do to Help My World by Melanie Walsh and One Child, One Planet by Bridget McGovern Llewwllyn. Our tweeps had the following book ideas to share: Angela likes Junkyard by Mike Austin, Heather suggested Rose’s Garden by Reynolds, Angie had a whole bunch like The Curious Garden by Brown, The Gardener by Stewart, Plant a Little Seed by Christensen, And the Good Brown Earth by Henderson and finally Brandy mentioned the lovely All the World by Elizabeth Garton Scanlon. Now that your books are chosen how about crafts and activities? I stumbled upon the gold mine that is the Earth Day and Environmental Awareness for Kids Board by Carolyn Hart of Storytime Standouts. 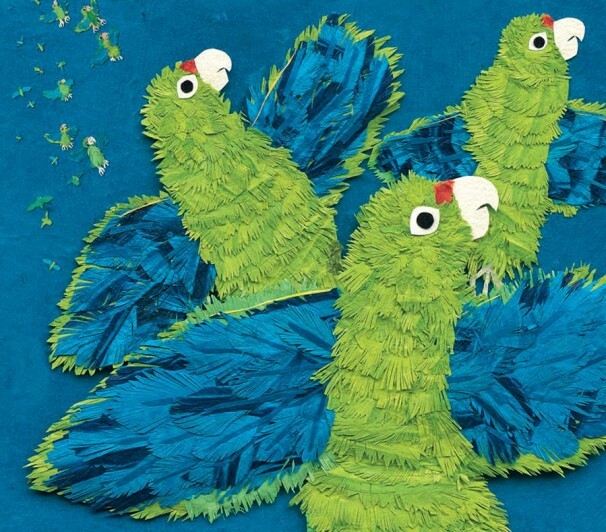 And then a couple storytime outlines to round us out: Earth Day Storytime by Mollie Kay, Preschool Storytime: Earth Day by LibrErin and with great music and puppet suggestions another Preschool Storytime: Earth Day by Carol Simon Levin. Because I truly think A Boy and A Jaguar is best suited for kiddies 5 and up I wanted to include some other resources for putting together a school age Young Conservationist program (or club, oh how 10 year old Dana would have swooned!) 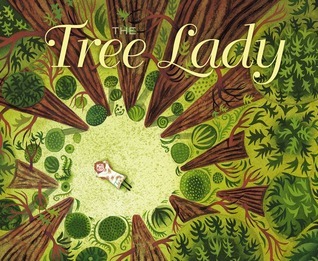 A couple other books which would be fun to read throughout a program, while throwing some songs and games in there include The Tree Lady by Hopkins, Parrots Over Puerto Rico by Roth, selections from the movement known as The One and Only Ivan or alternatively beautiful panels from Ottaviani’s graphic novel Primates. I found one really neat school age storytime on a new-to-me blog called Librarianism Chronicles all about Garbage, Garbage, Garbage! Finally our twitter-pal Brytani came up big with some music recommendations which could also be used with a crowd of any age. She likes Jack Johnson’s 3 R’s, Raffi’s This Land is Your Land (about Canada!) and Water in the Well. Hats Off to You: A Storytime! With Summer right around the corner I thought I would dust off one of my favourite storytimes- all about hats! The parents will love you for bringing hats back into fashion and the kiddies will adore the Silly Hat song. Or as Liz Anderson and I (and Michael Scott) like to say Win-Win-Win! I started this storytime like I start most of them: by singing Hello Friends and then getting warmed up with Roly Poly and Open Shut Them. I like to kick off the theme with a Flannel Story or a puppet so I did Animals Should Definitely Not Wear Clothing which scared me for a while because of having so many pieces but it was a whole barrel of fun! With the animals wearing clothes on so many different body parts we familiarized ourselves with our body parts- focusing on the most important part of course, the head!